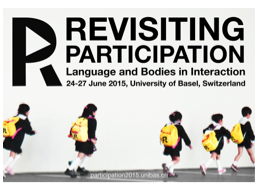 In June 2015, the “Revisiting Participation: Language and Bodies in Interaction” conference took place at the University of Basel in Switzerland. It was a tremendous success, and I’m delighted that three of the organisers, David Monteiro, Hanna Svensson & Nynke van Schepen have sent this enthusiastic report. 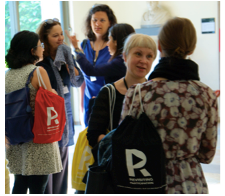 Almost 200 scholars in the fields of Conversation Analysis and Ethnomethodology gathered together at the Swiss city close to the borders of both France and Germany. Participants from all over the world, USA, Japan, Sweden, UK, France, Finland, the Netherlands, Brazil, Hong Kong, Denmark and Germany, to name a few, were present. Lorenza Mondada, conference chair and chair of general and French linguistics at the University of Basel, developed the idea to organize a conference more than a year ago. Beside big and exciting conferences gathering an entire community, like ICCA or IIEMCA, the idea was to have a smaller and more focused conference bringing together scholars interested in one particular issue. 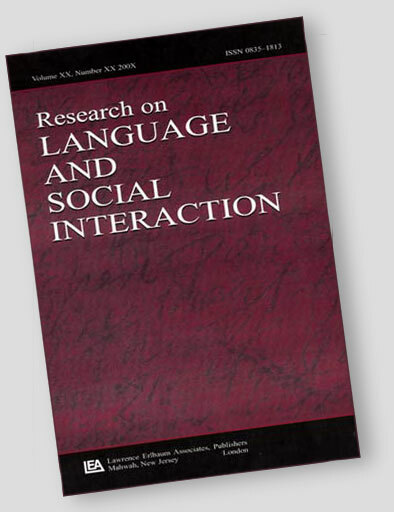 The issue of participation is both everywhere in conversation analysis and ethnomethodology, although it has not the status of a key concept in these disciplines. This was the occasion to revisit the term. Moreover, organizing a conference would map Basel as a centre for the study of social interaction and multimodality. It would also be the occasion for the younger organizing committee to learn what setting up a conference is about, since some had experience in doing so, whereas others were completely new. The year spent in planning, organizing, projecting events, anticipating details, and discovering contingencies, has been a terrific experience. even euphoric. The topic of participation was revisited in many ways. The keynotes showed how participation issues concern the fine coordination of embodied interactions in workplace settings (Christian Heath), the accumulation and transformation of resources mobilized by predecessors (Chuck Goodwin), the relation between self and other in repairs (Galina Bolden), the delicate interactional equilibrium between aphasic and non-aphasic speakers in conversation (Ray Wilkinson) and the use of touch as a ressource for participation (Candy Goodwin). The inspiring panels and papers showed an extraordinary diversification of terrains studied on the basis of video recordings, new challenges raised by the study of activities based not only on talk but also on manual and mobile activities, interesting and variegated social and spatial configurations of participants. After many very interesting talks, we all deserved a good meal, and so the conference dinner – on a boat! – was a welcome opportunity to talk in an informal way. Four days of intensive scientific discussion, but in great weather conditions and with the help of very many people, made this a great success. Thanks to all who participated, in whatever revisited way!